Drop a strong magnet through a copper pipe and watch it slow down as it enters the pipe. The invisible drag is caused by forces between the pipe and the magnet, induced according the laws of electromagentism. It's a magical demonstration for a class, made even better if the students are allowed to handle it. Video by HedgehogTH of a Neodymium magnet falling (very slowly) through a copper pipe. Fig. 1: Magnetic field lines around a loop of wire. Current is flowing clockwise. The ends of the wires point out of the page. Fig. 2: A disk magnet falling inside a copper pipe. The magnetic field lines of the magnet are in black (north pole up). Representative induced currents around the perimeter of the pipe are shown in blue with blue field lines. Fig. 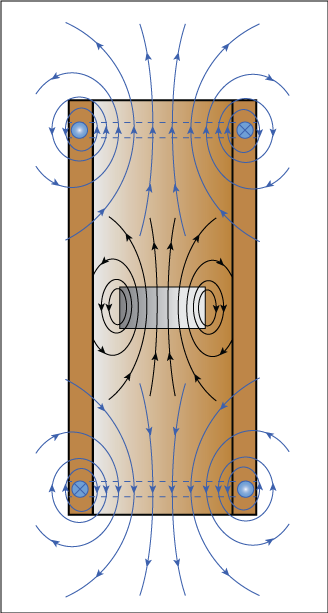 3: Detail of a magnet falling in a thick pipe, showing the different induced currents towards the inner and outer walls of the pipe. This demonstration has been popular for many years and has been posted many places, but the video above is one of the very best. A strong Neodymium magnet is dropped through the center of a conducting pipe. Instead of falling through at the normal acceleration, it floats downward at a snail's pace. There is no sleight of hand involved. This marvelous effect is a consequence of the laws of electromagnetism. WARNING: Neodymium magnets are very strong and must be kept away from electonics chips and credit cards. They are also brittle and can shatter when dropped. Two fundamental laws of electromagetism are relevant. 1) The first, known as "Faraday's Law of Induction", tells us that a changing magnetic field creates an electric field (and consequently an electric current) in the conductor. This is the principle behind the operation of electric generators, which use moving magnets (or moving coils) to generate electric current. 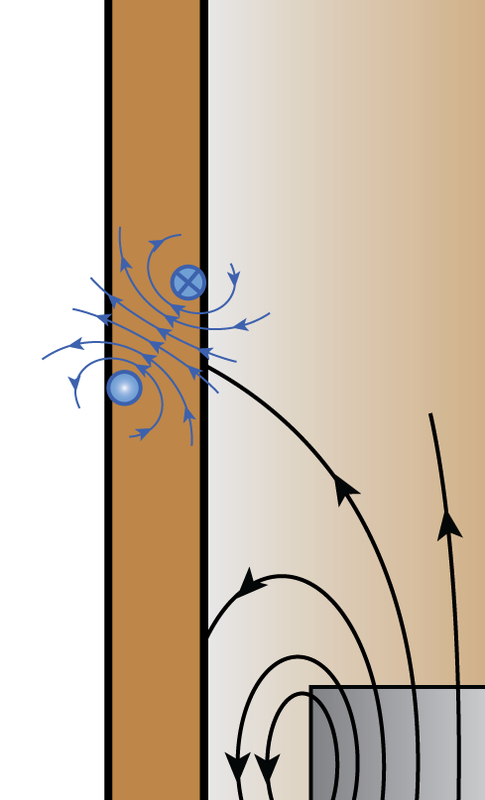 In this demonstration, the falling magnet changes the magnetic field in the vicinity of the conductor as it falls past, creating electric currents in the pipe. These currents are sometimes called "eddy currents", named after the analogous currents in water that sometimes cause persistent vortices. 2) The second, known as "Ampere's Law", tells us that electric currents produce magnetic fields. This law explains how an electromagnet works. When an electric current is sent through a wire coil, it turns the coil into a magnet. Figure 1 shows the magnetic field lines around a simple loop of wire that is carrying a current. For more information on magnetic fields and field lines, please see our lesson on Iron and Magnets. For more examples of field lines around current-carrying wires, see our lesson on Basic Electromagnets. It turns out that the magnetic field created in the conductor always resists the change in the external magnetic field. If the external magnetic field is falling, an induced field is generated in the same direction to try to make up the difference. If the external magnetic field is rising, the induced field is in the opposite direction, trying to reduce the effect of the increase. This opposition is also a law of electromagnetism, which usually goes by the name Lenz's law, but it is more of a corollary than a fundamental law. Figure 2 shows a diagram of representative currents and fields in the copper pipe. The field lines of the neodymium magnet are shown in black. The north pole is assumed to be pointing up (the field lines point up). As the magnet falls through the pipe, current is induced underneath it, which runs around the perimeter of the pipe in the clockwise direction as viewed from above.1 The dashed blue lines show a representative current loop going into the page on the left side (indicated by the blue circle with the cross) and coming out of the page on the right side (indicated by the blue circle with a white dot in the center). The field produced by this current loop is indicated by the blue lines with arrows. It looks a lot like the field from the disk magnet, except it is upside-down; the falling magnet has its south pole facing down, while the current loop has its south pole facing up. A similar effect occurs above the falling magnet. In this case, current is generated in the opposite direction (counter-clockwise from above) and produces a field with the south pole facing down. The two current loops both oppose the effects of the falling disk magnet. The falling disk magnet with its south pole facing downward encounters a magnetic field from the lower current loop with its south pole facing upwards. Since like magnetic poles repel each other, this field tries to push the disk magnet back upwards. Similarly, the upper current loop produces a field with its south pole facing downwards. This south pole pulls on the nearby north pole of the disk magnet, and tries to pull it back upwards. Together, the two current loops conspire to slow the fall of the disk magnet. The pattern of induced currents is not quite as simple as we may have led you to believe. To see the pattern of currents in more detail, let's look at a small region of the pipe above the disk magnet in figure 3. At this instant, the magnetic field from the disk magnet is pointing up and to the left as it enters the conductor. The disk magnet is falling away however, so the current induced in the pipe tries to augment the field from the disk magnet to prevent it from diminishing. In order to produce a field in the correct direction, there must be a current going into the page on the high inside wall of the pipe, and a current coming out of the page on the low outside wall of the pipe, as shown in the figure. In between those two currents, each of which goes all the way around the pipe, the field is in the correct direction. Similar currents must be induced for each portion of the pipe. Now, the currents on the inside of the pipe and the currents on the outside of the pipe need not be the same magnitude. In fact the net current on the outside of the pipe must be larger than the current on the inside in order to produce the correct field at the center of the pipe. (The net combination of both currents in the pipe should look approximately like the overall current loop in figure 2.) Moreover, the change in current density along the pipe cannot be the same inside and outside as long as the direction and strength of the field is changing along the pipe. At the side of the disk magnet, the field strength is small and isn't changing rapidly as the disk magnet falls by, so the induced currents there are small. This need for different currents on the inside and outside of the pipe in order to precisely oppose the changing field of the disk magnet helps to explain why a thick conductor is preferred for this effect. A really thin conductor doesn't provide much room for the two currents to exist side by side. Note: When trying these demonstrations with magnets and conductors, make sure the conductor itself is not magnetic. Steel or iron will automatically magnetize to attract the magnet, and will overwhelm any repulsive effects due to Lenz's law. The demonstration in the video above is not terribly cheap. The Neodymium magnets used in the video may cost \$20 to \$50, and at the time of this writing, copper sells for about \$7 per kg,2 which puts about \$30 worth of copper in what I'm guessing is a 4kg pipe. A fat copper pipe of the type shown is also hard to find. Most standard plumbing uses much thinner pipe. Thin-wall copper plumbing pipe from the local hardware store can still be used with smaller magnets. Get yourself a long piece of pipe (at least a couple of feet long) so that it takes a long time for the magnet to fall through. Choose a magnet with a diameter just small enough so that it doesn't drag against the wall of the pipe as it falls. It's especially magical to hold onto the copper pipe while the magnet falls through. You can feel the electromagnetic force on the copper pipe trying to pull it downward. You can also demonstrate the Lenz effect with a copper or aluminum plate. Drop a strong magnet onto a thick metal plate and you will see the magnet slow down just before it hits. For a small magnet the effect is noticeable only a millimeter or two above the plate, but for large magnets the effect can be quite dramatic. See http://www.youtube.com/watch?v=qtcVtmkDXLk for a nice example. For a less expensive demonstration that's good for the whole class to see, try rolling a small cylindrical magnet down a metal incline. A piece of aluminum angle bracket works well. 1. I'm following the convention of current pointing in the direction of positive charge flow.